C-SPAN tweeted out a five-minute clip of Ocasio-Cortez questioning James W. Carroll, the White House’s director of drug policy, with this quote highlighted: “@AOC compares #OpioidCrisis to #SouthernBorder: ‘So, we’ve got two emergencies, one is treated with an actual action and the other is just to raise awareness.’ "
Ocasio-Cortez then retweeted it with the comment above, earning nearly 50,000 retweets and likes. In her questioning, Ocasio-Cortez focused especially on the Public Health Emergency Fund — according to the Government Accountability Office, the fund has just $57,000 in it — and whether the declaration of a public health crisis regarding opioids should have triggered a transfer of money from other agencies, a la Trump’s maneuvers to build a wall. “Did the declaration of a public health emergency for opioids make any additional funding available to expand treatment for individuals for overdose to provide services for people in recovery?” she asked. But Ocasio-Cortez is making a highly misleading comparison. Here’s what’s going on. Earlier this year, Trump demanded $5.7 billion to fund his proposed border wall. Congress refused to do so, even after Trump engineered a lengthy government shutdown. So he declared a national emergency and said he would transfer funds from other agency accounts. Ultimately, the courts will sort out whether he has the power to override the congressional control of the purse. In the case of the opioid crisis, Trump in August 2017 acted on the recommendations of a task force on the crisis and “instructed his administration to use all appropriate emergency and other authorities to respond to the crisis caused by the opioid epidemic,” the White House said. In October 2017, acting health and human services secretary Eric D. Hargan said that, at Trump’s instruction, he had declared a “nationwide public health emergency.” The declaration has been renewed five times. Such declarations allow the HHS secretary to take a variety of steps, including using money appropriated for the Public Health Emergency Fund. Congress also moved other legislation, including passage in late 2018 of the Substance Use-Disorder Prevention that Promotes Opioid Recovery and Treatment (SUPPORT) for Patients and Communities Act, a legislative vehicle for dozens of bills to address the epidemic. The final appropriations bill that Trump signed in February, which included Justice Department funding, also included $77 million for drug courts to support nonviolent offenders in recovery, $22 million for men and women in uniform suffering from addiction and $87.5 million for offender reentry and research activities. In other words, the situations are not comparable. Trump wanted almost $6 billion for his wall, which Congress refused. But Congress acted to give the administration more than $6 billion for the opioid crisis, so there was little need for him to transfer funds without congressional authorization. Ocasio-Cortez asked whether there was additional funding for overdose victims and people seeking recovery — and the answer is yes. In a red herring, at the hearing Ocasio-Cortez focused on the fact that there was only $57,000 in the Public Health Emergency Fund. This is a relic from 1983 that has rarely been used. In the GAO report, HHS explained that it was not necessary to tap this fund to deal with the opioid crisis. “Department of Health and Human Services (HHS) officials determined that other authorities could be used, rather than public health emergency authorities,” the report said. “HHS also provided evidence that the Public Health Emergency Fund currently contains approximately $57,000.” It was last used more than a quarter-century ago. Confusing matters, there is another entity called the Public Health and Social Services Emergency Fund, which was appropriated with more than $2 billion in fiscal 2019. This fund is intended to respond to the health and medical consequences of all public health emergencies, including bioterrorism, but only a small part appears to be dedicated to the opioid crisis, mainly to provide funding to civilian volunteer medical reserve corps that help combat the crisis. 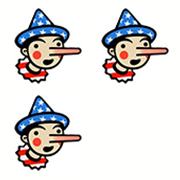 Ocasio-Cortez’s staff did not respond to The Fact Checker’s queries. Ocasio-Cortez is making a misleading comparison. Trump has no need to transfer billions of dollars for the opioid emergency because Congress has appropriated billions of dollars. Trump’s backing of a national public-health emergency did more than raise awareness; it triggered a congressional response. So it’s the exact opposite of the standoff over the wall. One can question the effectiveness of the Trump response to the opioid epidemic without resorting to red herrings and false equivalency. Only in the most narrow technical way is her statement correct, so we cannot quite consider this a Four-Pinocchio claim. So Ocasio-Cortez earns three.